Want a very different kind of party? Why not book us for a unique and unforgettable party or event?! 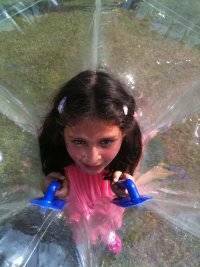 The thrills and spills of BodyZorbing is great fun for children and for adults alike. 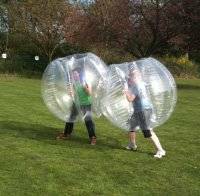 It is hugely entertaining for everyone, a great way to get active and is challenging physical fun. Plus it is a great game for parents to play with their children - so why not give it a go? The Zorbs are made out of A1CTPU or TPU hard wearing plastic and each has a 4 point harness. They are surprisingly resilient and have 6 intersections to add to their strength. 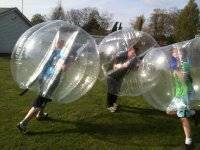 As players only bump into other BodyZorb players, then everyone has double protection. In the unlikely advent of a puncture, the Zorbs can easily be fixed by strong holding tape until they are correctly repaired later. 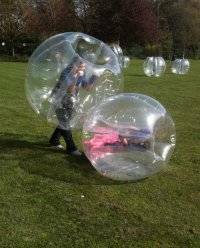 The Zorbs are such good fun for most age groups. For children's birthday parties, everyone must be at least 1 meter tall, but we don't just do birthday parties for children but for adults as well. We have different sized balls to fit different ages and body sizes. We supervise the parties and include team games and challenges and make sure the birthday child feels special on the day. 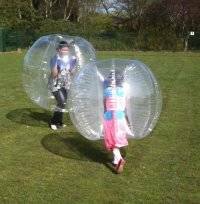 As well as birthday parties we also attend school fun days, festivals, carnivals and offer group sessions for hen parties and corporate events. We are based at Parrs Wood High School, in Didsbury, but we also travel to Stockport, Greater Manchester and North Cheshire. We operate outdoors from April until Nov. We are closed in the Winter months of December, January, February to mid-March.